Hello friends! I have a new card to share using some fun goodies from Simon today. Enjoy the little things – this is something I need to be sometimes reminded of, to remember to take joy in ordinary everyday things and moments. 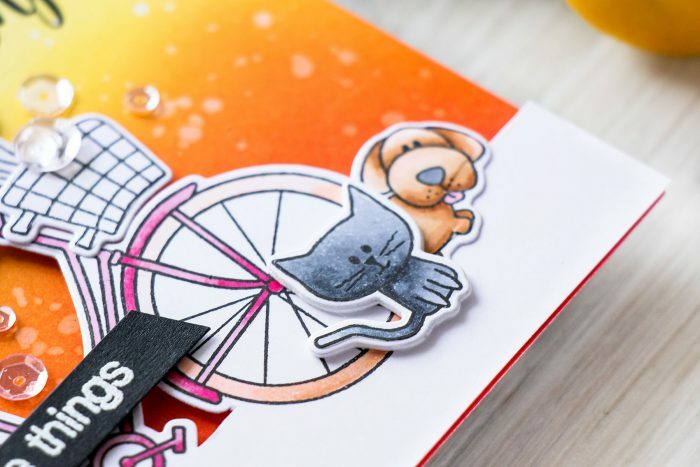 To create this card I stamped the bicycle image onto a panel of X-press It paper, colored with alcohol markers (I used Copics as well as First Edition Twin Markers) and partially cut the bike out leaving the bottom part of the panel attached. 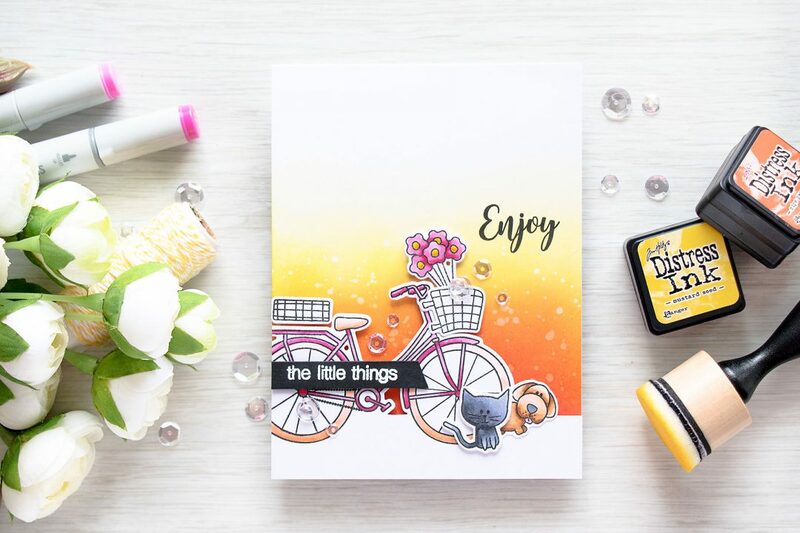 I also stamped, colored and die cut a few companion images – a kitty, puppy, baskets and some flowers. 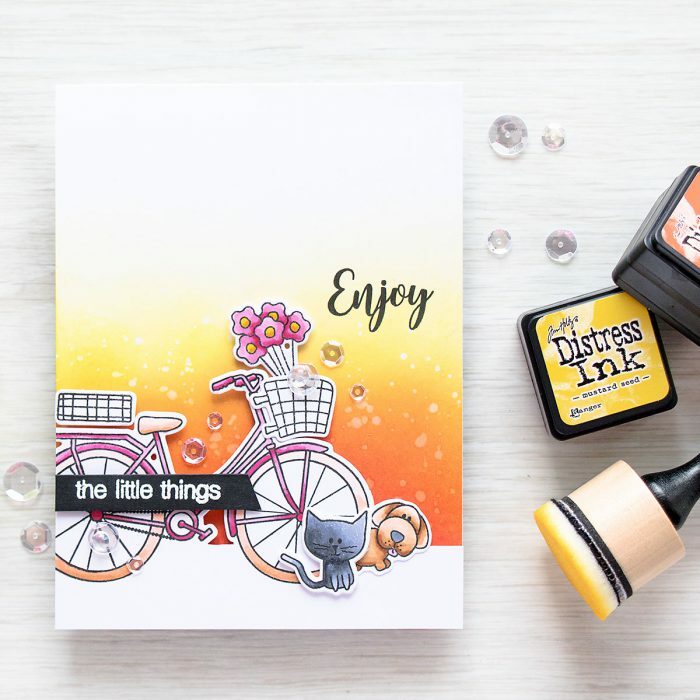 I knew I wanted to create sunset type of scene and have my bike overlap it, so I blended several colors of Distress inks (all colors linked below) onto an A2 white card base and added some water drops to diversify the background, didn’t add too much as I was using non-watercolor paper and I didn’t want it to warp. My bike panel was foam mounted over the card base, I also adhered additional images to dress it up a bit. 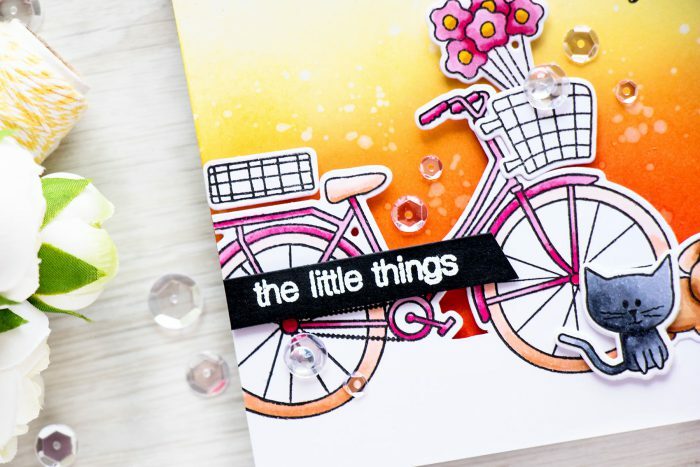 I split the sentiment into 2 parts – stamped Enjoy directly onto the card base and heat embossed “the little things” in white over black cardstock strip. I also added several clear sequins from Pretty Pink Posh to finish this card. Breathtaking card! Such a beautiful blending of the background, along with the white bottom looks amazing! And these cuties next to the wheel – so adorable! I love this card Yana. The beautiful background colour really sets off the bike!